About five tonnes of suspected illicit tobacco have been seized in a series of raids in Glasgow. HM Revenue and Customs (HMRC) said the tobacco was worth an estimated £1.5m in lost duty and taxes. 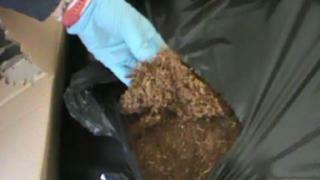 Authorities believe they have found two illicit tobacco factories as part of their searches. Three women - aged 37, 38 and 42 - and a man, 25, have been charged with excise duty fraud in connection with the find. The two tobacco factories were found during searches of five households, a commercial property, two self-storage containers and three vehicles on 21 February. A total of £4,000 in cash was also seized. Joe Hendry, of HMRC's fraud investigation service said: "The trade in illicit tobacco is unregulated and makes cheaper tobacco more readily available to the young and vulnerable. "The sale of illegal tobacco will not be tolerated by us or our partner agencies. Disrupting criminal trade is at the heart of our strategy to clampdown on the illicit tobacco market, which costs the UK around £2.5bn a year. "This is theft from the taxpayer and undermines legitimate traders."